Caring for the Earth is woven into all that we do at Morning Sun, from our solar powered homes, to deepening our connection with the Earth through meditation. 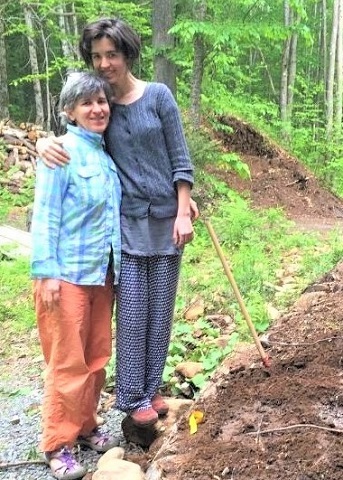 Retreats: This year we added a retreat called “Coming Home to Our Interbeing Nature”, where the entire retreat focused on deepening our connection and love for the Earth. Conservation: Sara Ciborski had 100 attractive metal signs printed to clearly mark the boundary of our 240 acres, 180 acres of which is in conservation, offering wildlife a safe refuge. This year we delighted in seeing many wild friends, including a moose with her calf, a baby bear, a bald eagle and some playful otters. 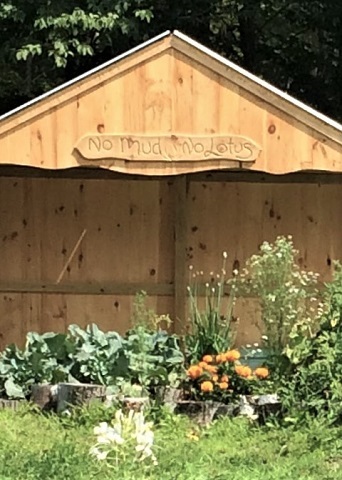 No Mud No Lotus: The MLS Program built our new compost and tool shed, with sign “No Mud, No Lotus” hung above it. This is a deeply healing teaching: that our “mud”, our inner challenges, is like our compost. The compost piles in our shed will nourish the vegetables in the garden, and the compost within us can provide the right nutrients for our compassion, healing and understanding to grow. Sharing with Children: Our children’s programs are always filled with moments to connect with the beauty of the Earth. In the garden children began their time imagining they were plants growing from little seeds, receiving water and light. Then they paused to watch the tender green leaves and butterflies, feeling the rich aliveness of the garden. They contemplated the interconnection of all things as they made medicine wheels with Laurie Rabut, and built Earth houses to offer gratitude prayers to the Earth and seed offerings to the animals. Apple Trees! : This year Ambrose worked with our local Alyson’s Orchard to select a variety of sapling apple trees to start growing for future Morning Sun fruit! We have about 30 baby trees growing. Tagged mindful living, mindfulness, morningsun. Bookmark the permalink.